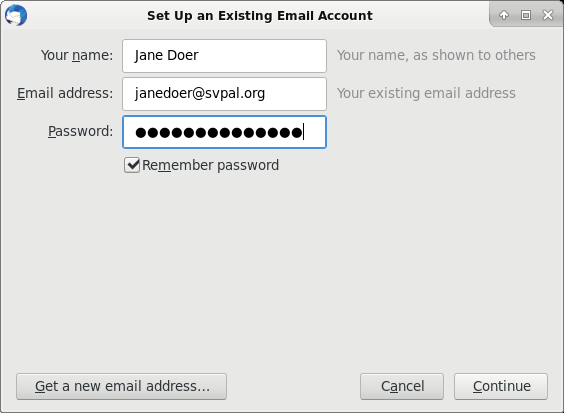 The following instructions guide you through setting up Mozilla Thunderbird email for accessing your SVPAL email account. If you are using a different version of Thunderbird or on a platform platform other than Windows, the steps may be slightly different, but you should be able to follow along. We have enabled auto-configuration support for Thunderbird, which greatly simplifies the setup process. Simply supply your name, email address, and password to the setup window and Thunderbird sets up the correct working configuration. Simply click Done to complete the configuration. [updat 10/30/2016]. If don't have Thunderbird installed on your computer, can obtain it from SVPAL's download page. SVPAL recommends Thunderbird for your email client. 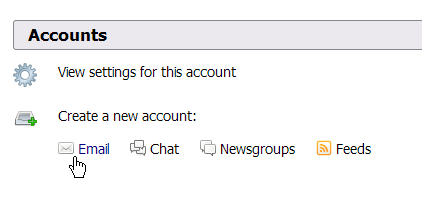 To add your SVPAL email to Thunderbird, go to the settings display, look under Accounts and find Create a new account:, click on the Email link. On the Set Up an Existing Email Account window, enter your name, your SVPAL email address, your password, and check Remember password. Click the Continue button. 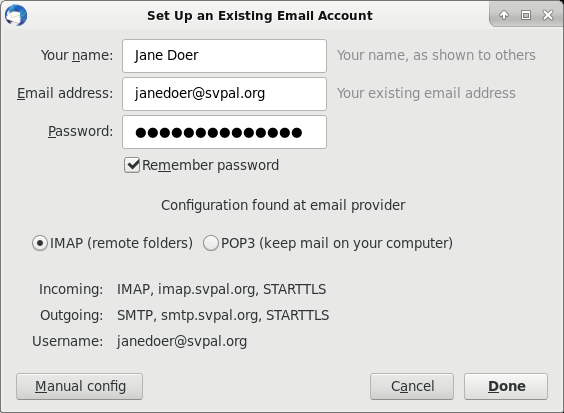 On the Mail Account Setup window enter your name, your SVPAL email address and your SVPAL password. Check the Remember password box. Then click the Continue to proceed. At this point the window may flash and display some messages. If all goes well, the window closes and your SVPAL email account appears on the left pane of the Thunderbird email client. If it fails the Set Up an Existing Email Account window remains, displaying an error message. You may need to make corrections or re-enter your information, and click the Continue button again. You may be prompted for your user name and password. You may optionally check the Use Password Manager to remember this password to have Thunderbird remember your password. You should not use this option on computers that are not physically secure, such as at a library.